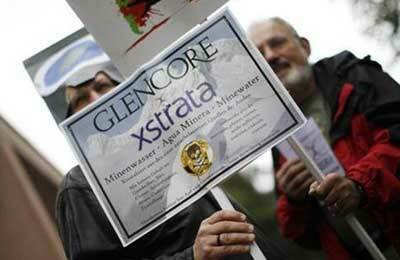 EU antitrust regulators have set a Nov 8 deadline to decide on whether to allow trader Glencore's $33 billion takeover of miner Xstrata, after months of talks which the companies hope will help avoid forced sales or a lengthier, in-depth probe. The European Commission said on its website on Wednesday that it had received the notification from Glencore, filed on Tuesday, setting the clock ticking for the regulator. Brussels officials now have just over a month to decide whether to approve, reject or begin a longer, "phase 2", probe into one of the largest mining takeover deals to date. Glencore, the world's largest diversified commodities trader, bid in February for the roughly 66 percent of Xstrata it does not already own, raising its offer last month after opposition to the terms from rival shareholder Qatar. EU regulators are expected to focus on the combined market power of what will be the world's fourth-largest diversified mining group. Together, the mining and trading powerhouse would be the world's largest thermal coal exporter, the top producer of both zinc and ferrochrome and the third largest copper miner. Antitrust regulators could receive further representation from bodies including Europe's influential steelmakers, worried over market dominance in some commodities. They are, however, expected to focus on zinc, where analysts estimate that Glencore and Xstrata combined would hold roughly 50 per cent of the European market. This could prompt concessions in the form of asset sales, analysts and legal sources said, with speculation centering on Xstrata's San Juan de Nieva refinery in Spain, the world's largest zinc production unit, or its much smaller Nordenham refinery in Germany. The sale of San Juan alone would virtually halve the new company's European market share, Jefferies analysts estimated earlier this year. "There is an element of who blinks first. They (Glencore and Xstrata) will want to project confidence in an unconditional, phase 1 clearance... but they will have a plan B in place," said a London-based competition lawyer, who declined to be named. "They may be the market leader, but is it enough to lead to grave doubts and a phase 2 probe? There does at least appear to be a potential complainant out there, in the form of Eurofer." Eurofer, the European steel producers association, said on Tuesday it would consider the details of the notification before deciding whether to call for a further probe. The European Union is one of three regulatory hoops that Glencore has left to clear, the others being China and South Africa. China, the world's largest consumer of commodities, has one of the youngest and least predictable of global regulators. China's Ministry of Commerce (MOFCOM) is one of few regulators to impose behavioural - and not structural - conditions on deals, meaning it has made demands around sales procedures or prices, for example, rather than asset sales.